Electroplating is the procedure that allows to cover the surface of a material conducting electricity with another conducting material. It's used mainly in the industrial field to cover metal objects with other more precious or noble metals. It's obtained by submerging the object to be covered in a solution prepared on purpose, which, through the action of the electric current, creates a chemical reaction which deposes on the object a layer of the new metal. The most used covering metals are gold, silver, copper, nickel, chrome and zinc. Many of these metals have the property of being resistant to corrosion and wear, and they are used to protect the object and make it last longer. Some of them can also improve the aesthetic aspect, as chrome, which looks like a shining metal (the bathroom sinks are an example: they are made steel, which is opaque, covered with chrome). Other metals can make the object more valuable, such as gold or silver. More in general, the covering metals used for electroplating are usually pure elements, but sometimes metal alloys can be used, such as brass. There are no limitations to the shape and the sizes of the objects to be covered. Since the covering process takes place by submerging the object into a liquid solution, it's possible to cover parts that with other methods, such as painting, would be difficult to reach. The only necessary condition to perform the process is that the object can conduct electricity. According to this condition, a distinction can be performed between electroplating and electrotyping. Electroplating deals with conducting objects, while electrotyping deals with non-conducting ones. The liquid solution in which the process takes place is called electroplating bath. This solution is typically formed by water and by the salt of the metal to be deposed. In some cases, such as for the precious metals, baths with cyanide are used. Their usage is anyway complicated, since cyanide is highly poisonous and the industries which use it must have special permissions and dedicated technicians. The electrodes are the conducting elements submerged into the solution which allow the electric current to flow through the solution and therefore the electroplating to take place. The electrode connected to the negative pole of the battery is called cathode, and it is the object to be covered. The electrode connected to the positive pole of the battery is called anode, and it can be made of the same material which is going to be deposed on the target object; it can be also made of another metal or of graphite. Solution concentration: the more the solution is concentrated, the more the deposition is performed quickly. A more concentrated solution means that more solute (in this case the salt of the metal to be deposed, or the cyanide compound) was dissolved into water. There is anyway a limit for the concentration of the solution, over which the the solute won't dissolve into the solvent any more, but will fall on the bottom of the container, or will float. In this case, the solution is saturated: the solvent isn't able to dissolve the solute any more. Electric current: the more electric current flows into the electrodes and in the solution, the more the deposition takes place quickly. To increase the electric current which flows in the circuit, two elements can be increased: the surface of the electrodes or the voltage supplied by the generator. There is anyway a limit to the current flowing into the circuit: over this value, the electroplating chemical reaction doesn't take place any more, since the high current creates other reactions which prevail on the electroplating one. Electroplating can be performed for small objects, like knick-knacks or jewellery, as well as for big structures, like car bodies. According to the size of the object to be covered, the physical quantities can change. The electroplating baths can have high or low concentrations, according to the used substances and materials, while the currents range from milliAmperes for small objects to tens of Amperes for big baths. The process of plating a metal object through electroplating can be divided in three parts: the preparation of the surface of the object, the bath and the final clearing of the dry surface. Mechanical cleaning: it's performed through mechanical methods involving, for example, metal brushes. It has the objective of eliminating the biggest impurities, such as rust or other industrial processing residuals. It leaves, anyway, the surface not perfectly clean, with shades and other impurities. Chemical cleaning: it's performed through chemical reactions, mainly through strong acids and bases, such as sulphuric acid, clorhydric acid or sodium hydroxide. Since the object is totally submerged into the cleaning liquid, the cleaning is total and complete. The two phases are often subsequent, even if sometimes only the chemicals cleaning is required. The cathode, which is the object to be covered, and the anode, which is another conducting element, are submerged into the the electroplating bath. The two electrodes are connected to a current generator. When it is turned on, the current starts to flow through the electrodes in the solution, and the metal begins to depose. After a specific time, computed through many different factors, the generator is powered off, and the object covered with the desired metal is taken off the solution. After the electroplating, the object must be washed, to delete the residuals of the bath, and sometimes processed furthermore, for example with polishing. Electroplating can be performed with many solutions, which allow to depose different metals onto the target objects. In this section a solution with cupric sulfate will be used. It is an intense blue salt which can be found in gardening shops and which is normally used in agriculture to protect plants from mushrooms, seaweeds and bacteria. The result of electroplating with such chemical product is the deposition of a thin copper layer on the object submerged into the solution. Please remember that cupric sulfate is a poisonous substance and should be handled with care. Figure 1: The image resumes the elements involved into the chemical redox reaction used into the electroplating process. The ionic bond is a kind of chemical bond which takes place typically between two elements with an electro-negativity higher than 1.9, that is between elements usually far on the periodic table, typically a metal and a non-metal. The result of a ionic bond is usually a salt, which is indeed the union of a metal with a non-metal. In case of salts the element with the lower electro-negativity (the metal) gives to the element with higher electro-negativity (the non-metal) one or more electrons, which go into the orbitals of the new atom. At this point the two elements aren't neutral any more, but they are ions: the atom which gave an electron becomes a cation, that is a positive ion, while the atom that received the electron becomes an anion, that is a negative ion (please note that the terms cation and anion refer to polarities inverted with respect to cathode and anode). The cation and the anion attract themselves, due to their opposite charges, and therefore remain bound, creating the salt. In the example considered in this article the salt is the cupric sulphate, with composition CuSO4. The cation is Cu2+, which gives two electrons to the anion SO2-4. First consider that the electric current in a metal is physically caused by a flux of electrons going out from the negative pole of a generator and entering the positive pole of the generator. The real flux of electrons is therefore opposite to the conventional direction normally used in electronics, which assumes that the current goes out from the positive pole of the generator. The chemical reaction involved in the electroplating is a redox, since the copper atoms loose and takes electrons. When the generator is turned on, it makes available the electrons to the cathode, connected to the negative pole, and it accepts electrons at the anode, connected to the positive pole. 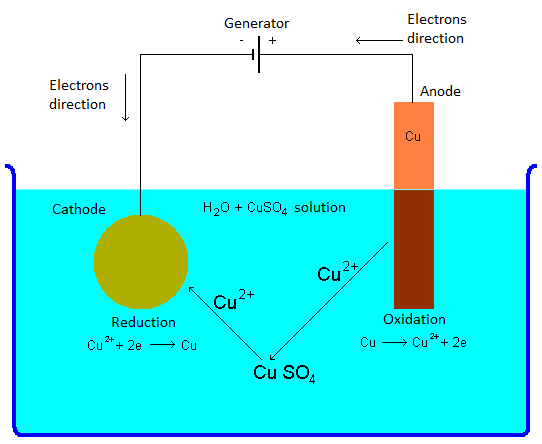 In case of the reaction considered here, the copper at the anode looses two electrode, which go to the generator, and becomes a cation Cu2+. This process takes the name of oxidation. The cupric sulfate CuSO4 dissolved into the solution breaks its ionic bond, becoming the cation Cu2+ and the anion SO2-4. The anion SO2-4 binds itself to the cation Cu2+ born at the anode, and recreates the cupric sulfate CuSO4. The cation Cu2+ which was part of the cupric sulfate initially dissolved into the solution goes towards the cathode, where it takes two electrons, supplied by the generator, and becomes a neutral element, deposing on the object. This process is called reduction. The anode, made of copper, reduced, even if only a little bit, its size, because it gave its atoms to the cupric sulfate. The concentration of cupric sulfate into the solution remains unchanged, since the copper atoms that the salt gave to the cathode were substituted by the atoms received from the anode. The cathode, which is the object to be covered, increased, even if only a little bit, its size, since it received on its surface the copper atoms. From the point of view of the generator, the net sum of electrons is zero: it received two electrons at the anode, but it gave two of them at the cathode.